The legacy of Al Capone holds many labels including: bootlegger, gambler, mob boss and murderer. His legacy also includes a fascinating and turbulent time in South Florida. There are many stories and urban legends that have had Capone everywhere during his time in Miami and Miami Beach. These stories have become more grandiose with time. 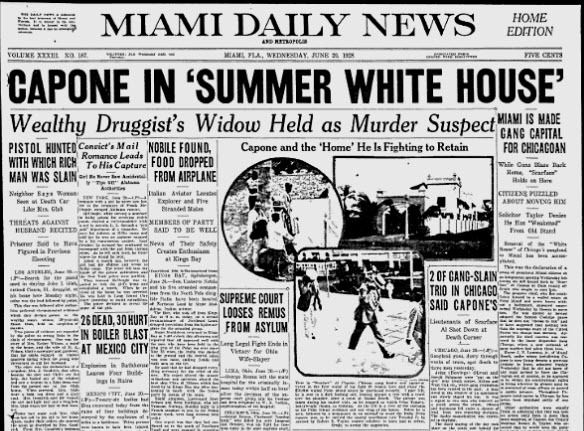 This is the first installment in a four part series on Al Capone’s time in South Florida and the reasons for him choosing Miami Beach as his home away from Chicago. While many of the stories that are still shared today about Capone are fascinating, this series will focus on what has been confirmed about the man and his time in Miami. Al Capone was on top of the world in 1927. Many of his enemies had been eliminated and he was considered the most feared and revered gangster in Chicago. It was estimated that his outfit made $108 million in 1927. However, there were a couple of very good reasons Capone ended up choosing to take a sabbatical from Chicago. Joe Aiello was a rival who possessed a large ego and even grander ambitions. When Capone saw to it to that Aiello’s business partner, Tony Lombardo, got elevated to presidency of the Unione Siciliana, Aiello became bitter. Aiello thought he deserved that post and was disappointed enough to seek retribution on Capone. In May of 1927, Aiello offered $50,000 to anyone who would kill Capone. There were several hitman hired, but Capone was tipped off on each plot and the hoods hired for the job were the ones that ended up dead. Finally, Capone’s men caught up with Joe Aiello in November of 1927 when he was arrested for conspiracy to commit murder. A conspiracy where Capone was the target. Considering that Capone’s gang found him in a detective bureau on the north side of town, Aiello was able to beg for his life and promised to leave town and never return. Capone agreed to his plea for peace and Aiello and his family left town immediately. Joe Aiello kept his promise for a little while. Once again, Capone felt invincible until his deal with the Mayor of Chicago, Big Bill Thompson, changed dramatically. Thompson let Capone run his business unfettered for most of his term as mayor. However, Thompson believed he would make a good successor to Calvin Coolidge as the next nominee for President of the United States on the Republican Ticket in 1928. He knew that his chances would be compromised if he didn’t begin to appear tough on the criminal element in Chicago. Thompson brought Mike Hughes back as police chief and Hughes began a personal mission to chase Capone out of Chicago. In December of 1927, Capone got the message and announced that he would leave for Saint Petersburg, Florida to sell property he owned. While Capone stated he would not be back until after the holidays, Chief Hughes made it clear that he was not welcome to ever come back. His announced trip to Saint Petersburg was just a misdirection. Capone ended up going out west with two bodyguards. His first stop was Tijuana, Mexico and then he headed north to San Diego. His next stop was Los Angeles where he and his bodyguards got a suite at the Biltmore Hotel. Capone’s visit to Los Angeles was reported in the LA Times and caught the attention of Los Angele’s police chief, who dispatched his toughest detective to send the message that Al Capone was not welcome in LA. While Capone was insulted by the message, he didn’t want any trouble in LA, and chose to head back to Chicago. The reporters continued to follow Capone on his journey back to the Midwest by train. Capone got an unwelcome reception at every stop. The police were in force at every train station, making it clear that none of the cities along his route home were suitable places for Capone to visit. Once Capone arrived close to home, he and his men were stopped in Joliet and arrested for possession of concealed weapons. Once he was released and paid his fines, he left for his home on South Prairie, only to be greeted by more of Chicago’s finest. The message was clear, Capone needed to find another home. At least for the time being. Capone was very fond of Miami long before he arrived there in December of 1927. He referred to the town as “the garden of America, the sunny Italy of the new world, where life is good and abundant, where happiness is to be had even by the poorest”. He was especially fond of the anything goes indulgence of Miami in the 1920s, including rampant gambling and a complete disregard for prohibition. Miami was Capone’s kind of town. So, he had thought. After his last visit from the Chicago police in December of 1927, Capone decided he would investigate life in Miami. 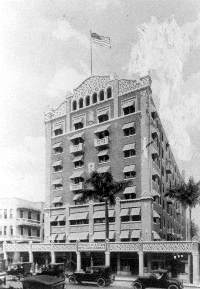 Capone registered at the Ponce de Leon, a hotel in downtown Miami on Flagler Street, under the name of “A Costa”. Capone took suite 804, which was the penthouse suite on the top floor of the hotel. 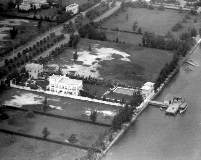 Capone also rented a house on Miami Beach’s Indian Creek for Mae and Sonny, his wife and son. The home was later characterized as a “palatial home” by the government. Capone paid $2500 per month to rent the home. There were several prominent groups in Miami that opposed Capone’s presence in their city. The Miami Beach Chamber of Commerce voiced their objections. The Women’s Club and an upstart group that called themselves the Committee of One Hundred began to badger Miami Beach Mayor J Newton Lummus, Jr. to do something. The Miami Beach City Manager, Claude Henshaw, and Mayor Lummus requested a meeting with Capone. While Capone never really had any intention of leaving, he did keep the meeting and told the men that he would leave if he were not welcome. Capone insisted he was in Miami to relax and not to cause any problems. Both Henshaw and Lummus were satisfied with Capone’s statements. They conveyed to Capone that the majority of citizens didn’t want him to remain in Miami, but neither men insisted that he leave. Parker Henderson Senior arrived in Miami in 1906 where he started a lumber company with his brother in law. He later bought his brother in law out of the business and renamed the company P.A. Henderson Lumber Company. Henderson was best known for being a two time Mayor of Miami. He was the 7th and 11th mayor of the young city. He was first elected in 1915 and later re-elected in 1923. He died in office on July 25th, 1925 and is buried in a white marble mausoleum in the Miami City Cemetery. His son, Parker Henderson Jr., avoided politics but did manage to get into the hotel business. Henderson signed a lease to operate the Ponce de Leon Hotel in August of 1927. His lease was for $35,000 per year for five years. The hotel contained 150 rooms and was ideally located at 231 East Flagler Street, just two blocks west of Biscayne Boulevard on one of Miami’s most important streets. The hotel featured an open patio providing guests a prominent view of Flagler Street from both directions. After checking into the Ponce de Leon hotel, Al Capone quickly recognized that the manager was an eager pleaser that could be made very useful. Capone introduced Henderson to real gunman and prominent members of his gang. Capone also invited Henderson to Indian Creek for dinner with his wife, son and other members of his inner circle. Henderson was giddy to be considered part of the outfit and soon began running errands and providing favors for Capone. From January 14th until April 2nd in 1928, Henderson, along with one of Capone’s bodyguards, picked up money orders from Western Union, totaling $31,000. The checks were made out to “Albert Costa” and Henderson was the one to endorse the checks as Albert Costa. Henderson found this new life very exciting. One of those favors would later bring a lot of unwanted attention to Henderson and would represent the end of his relationship with Capone. Capone asked Henderson to purchase guns and to leave them in an empty room at the Ponce de Leon. Parker purchased 12 guns from a Miami pawn broker and left them where he was instructed. One of these guns would later be used in a high profile murder in New York City. In addition to playing the role of Capone’s loyal errand man, Henderson also was Capone’s real estate representative. While most of the real estate agents in town pestered Henderson for an introduction to Capone, Henderson chose to work with Newt Lummus Jr., the Mayor of Miami Beach. The two men would end up finding what would become Capone’s iconic Palm Island home. Palm Island is a manmade island in Biscayne Bay, a narrow island about three quarters of a mile long, located right off of today’s MacArthur Highway. While the island sits between Miami and Miami Beach, it is considered a part of Miami Beach’s jurisdiction. Capone became very interested in one of the homes located on this island. The home at 93 Palm Island was built by Clarence M Busch as investment property. He sold the home to insurance broker James W. Popham. The mansion was a fourteen room, two-story, white stucco, Spanish Style home built in 1922. The lot was one hundred feet along the road and ran three hundred feet back to the bay on the north. A three room gatehouse stood on the road. Capone gave Henderson $2000 earnest money and had him and Newt Lummus Jr. offered $40,000 to James Popham. The terms were accepted and the transaction closed on March 27th, 1928. At the suggestion of Lummus, who was anticipating the likely reaction for the sale of property to Capone, Henderson signed all paperwork as if he were the purchaser and new owner of the home. Capone immediately ordered the start of improvements to the home, which would ultimately cost roughly $100,000, including the addition of the largest privately owned swimming pool. The pool’s filtration system was able to handle both sea and fresh water. Much like the purchase of the home, the permits for all improvements to the home were taken out in the name of Parker Henderson Jr.
Capone got very involved with supervising the refurbishment of his new home. He added a new dock for his speedboats, new garages, a boathouse, mosaic walks, rock gardens and fountains. He paid for the very best, and made sure the workmanship was to a very high standard. Capone was also very good to his contractors and workers. While working outside, a group of tile layers took a lunch break only to find their lunch pails missing. Capone had one of his men gather their lunches and then summon the workers to enjoy an enormous feast in his home. One of the workers later recalled that “Mr. Capone wanted to make sure we were treated like kings because he wanted a good job on his house”. Capone was very proud of the result of his renovations and would often provide a tour of the home and ask his visitors what they thought of the improvements that he supervised himself. By the summer of 1928, Henderson was getting very nervous that word would get out about Capone purchasing a home on Palm Island and that his role would be exposed to his fellow Miamians. On June 16th, 1928, just prior to Capone taking occupancy of his new home, Henderson left Miami for Asheville, North Carolina, to avoid the backlash he knew was coming. Within six months of the close date, Henderson officially signed over the deed for 93 Palm Island to Mae Capone. It took six months before the owners of the Indian Creek home to realize who rented their property. The lease was signed under the name of “Al Brown” and the owners discovered that their tenant was really Al Capone. While they were traveling on holiday, they heard a ship’s radio news flash announce that Al Capone was living on Miami Beach at their address. When the property’s owners returned at the end of the lease, they expected to find their property in disrepair. However, they found their home completely free of any damage. Not only was there nothing missing, but they found an upgrade to the homes silver and china. Given the scale of entertaining that occurred, the Capones found some of the furnishings inadequate, so they purchased and left behind a number of items for the owners of the property to keep. The only concern of the owners after the Capones left the property was an unpaid phone bill of about $400. However, shortly after moving out, Mae Capone showed up and handed over $500 to settle up. When the owners could not make change, Mae told them they can keep the difference. By mid-June of 1928, it was becoming very clear that the home purchased in the name of Parker Henderson Jr. was really purchased on behalf of Al Capone. Miami and Miami Beach residents were very vocal about not wanting the infamous gangster as a neighbor. The role of Newt Lummus Jr. for the Palm Island purchase was revealed around this time. The Miami Beach City Council was up in arms and called for his resignation. At the same time, the City Council issued a formal “proposal” to provide aid to local authorities to oust Capone out of Miami Beach. During a very contentious city council session, Lummus defended his participation in the sale of the Palm Island home to Capone and ended up voting to support the proposal. The Cities of Miami Beach and Miami, as well as Dade County, were all united to work toward the removal of Al Capone from the area. Lummus’ view on Capone was as opportunistic as a number of the other politicians and local business leaders in South Florida. While they publicly supported the removal of Capone from the area, they also would privately welcome any opportunity to benefit financially from Capone’s generosity. Ultimately, Lummus survived the back lash of his role in Capone purchasing a home. He remained as Mayor of Miami Beach until the completion of his term in December of 1928. Frankie Yale was a Brooklyn Crime boss and former employer of Al Capone prior to Capone moving to Chicago to work for Johnny Torrio. Torrio was Yale’s mentor, and the relationship between Yale and Capone was always good until the spring of 1927. Frankie Yale had supported Joe Aiello’s bid to become the president of the Unione Siciliana, but Capone favored Tony Lombardo for the spot. Once Lombardo took over presidency of the Unione, Yale began to resent Lombardo’s approach to conducting business and began to notice diminished proceeds remitted to him from the Unione. Yale chose to make up the difference in income at Capone’s expense. He began to hijack some of Capone’s trucks carrying whiskey through Long Island. Yale’s gang was responsible for ensuring safe passage for Capone’s trucks through New York. Capone began to suspect Yale of double crossing him and his suspicions were confirmed by an inside informant, Filesy DeAmato. While DeAmato was sharing what he learned to Capone, someone overhead the conversation and Yale ultimately had him killed on July 7th, 1927. After DeAmato’s death, the hijackings continued. Capone took his time plotting his revenge. It took a year, but on July 1st, 1928, several of Capone’s men plotted and successfully killed Frankie Yale in New York. While fleeing the murder scene, the shooters ultimately abandoned their getaway car and left the weapons they used to kill Yale. One of the guns found in the abandoned car was an automatic pistol that Henderson had purchased on Capone’s behalf earlier in the year. The identification of that gun would ultimately lead the investigation to Miami. It took less than a month to determine that one of the guns used in the killing of Frankie Yale had roots in Miami. The serial number of an automatic pistol was traced directly back to Parker Henderson Jr. The Miami News on July 31st, 1928, announced that Henderson would be accompanied by Police Chief Guy Reeve to New York to answer questions related to the gun that was linked back to him. Henderson had already signed an affidavit stating that he had purchase 12 guns as a favor for Capone. The New York Police Department was satisfied that Henderson was in North Carolina during the murder and that he was not a suspect. They brought him to New York to supplant his affidavit with more detail. 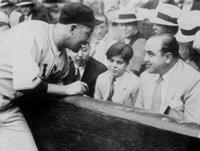 Later, Al Capone would also be questioned about his knowledge of the Frankie Yale murder. In the meantime, the Yale murder set off revenge murders of two of Capone’s men. Capone’s handpicked president of the Unione Siciliana, Tony Lombardo, was the next victim. Lombardo’s successor as president of the Unione Siciliana, Pasqualino Lolordo, was also a friend of Capones. He was gunned down and killed on January 8th, 1929, in his home. Lolordo’s wife identified Joe Aiello as one of the men present in their home when her husband was killed. Lombardo’s murder was orchestrated by members of Yale’s former gang, in conjunction with Joe Aiello. Aiello was once again back in Chicago causing problems for Capone. In addition to Aiello, two of George Moran’s crew participated in Lolordo’s murder. Just as Capone got news of Lolordo’s murder in January of 1929, he was at his Palm Island home and had taken to bed with pneumonia. His recovery gave him time to plot the revenge of the murder of his two friends. Capone would strike back on Valentine’s Day. 1 Comment on "Al Capone in Miami – Part 1 of 4"